Want to see the details? CLICK HERE to view full-screen photo. Check out those five targets. The Aggregate (average) of all five targets is a tiny 0.0840 inches! These were shot by Gary Ocock at 100 yards in a California benchrest match on August 6, 2017. Though Gary’s 0.0840 Agg beats existing records, this was not a “sanctioned” match, so Gary’s killer Agg will NOT be submitted for IBS or NBRSA records. So, sadly, the Agg won’t appear in the record books, but this remains a spectacular, verified feat of rifle accuracy, accomplished in competition. The argument can be made that this is the Most Accurate Gun Ever Built. As far as we can determine, no one has ever shot a smaller 5-target Agg anywhere, at any time. When the top 15 shooters all post teen Aggs, conditions must be pretty favorable. However there were some light switchy winds — Gary said that he shot better in the left to right condition. Ocock’s red Jay Young Unlimited Railgun features one major difference from Young’s typical Railgun designs. The bottom of the barrel block is integral with the top (moving part), of the gun. The barrel is Ocock’s usual 1:13.5″-twist Krieger chambered for the 6 PPC. The BAT Neuvo action* is unusual in that its lugs are horizontal at lock-up instead of the usual vertical. With horizontal lugs, both lugs maintain contact with their abutments when the action is cocked. In the more normal configuration when cocked the top lug is forced off of its seat by a combination of the angle of the trigger cocking piece interface, the pressure of the striker spring, and bolt clearance at the rear of the action. Gary shot this remarkable Agg with well-used brass, Vihtavuori N133 powder, and self-made 66gr BT bullets** seated at “jam”. This amazing Agg was shot on the second day of a 2-day Unlimited Benchrest match. On Day 1 Gary had experimented with various loads using both surplus IMR 8208 and Vihtavuori N133, but was not satisfied with the results. For his first group on Day 2, Gary tried a light load of N133. After seeing the result, however, he decided to go to the other extreme — a super stout N133 load — with the same powder. As you can see, Gary’s willingness to experiment paid off. Notably, Gary used light neck tension. Ocock found that for these bullets and this barrel, light neck tension worked best (contrary to “normal” N133 benchrest practice). Ocock used a bushing that only produces .001″ difference between the diameters of sized and loaded case necks. Congratulations to Gary Ocock for superb shooting (and smart loading). Even though the match was not sanctioned (so the Agg will never be a record), Ocock has raised the bar very high, and given us a new standard of ultimate accuracy. Though this 0.0840 Aggregate and 0.018 group will never go into the record group, they are still noteworthy. There’s virtually no doubt that they would have survived inspection by any record committee. Except for the lack of fixed backers, an IBS requirement (for detecting cross-fires), all other conditions were met for an officially-sanctioned match. *The new BAT Neuvo actions are the result of a collaboration between Dwight Scott, and Bruce Thom, featuring Dwight’s ideas and BAT’s proven manufacturing expertise. ** Ocock shot his own, boat-tail match bullets, made with George Ulrich-crafted dies using Hood cores. Although he said that it had been a while since he had weighed any, his best guess was that they weigh something around 66.5 grains. Share the post "Gary Ocock Shoots Amazing 0.0840 Aggregate with Railgun"
Sometimes superlatives really aren’t necessary. Just look at that target. Yes that is FIVE shots (although it truly appears like one hole). And it is centered! This remarkable group, measured at 0.039″, was shot by Lou Murdica in Phoenix on January 3, 2015. Lou drilled this group with his 6 PPC railgun. Rounds were loaded with Accurate LT-32 powder and Berger 65gr BT bullets. The target will be submitted to the NBRSA as a potential new 100-yard Benchrest record in the Unlimited (Railgun) Class. 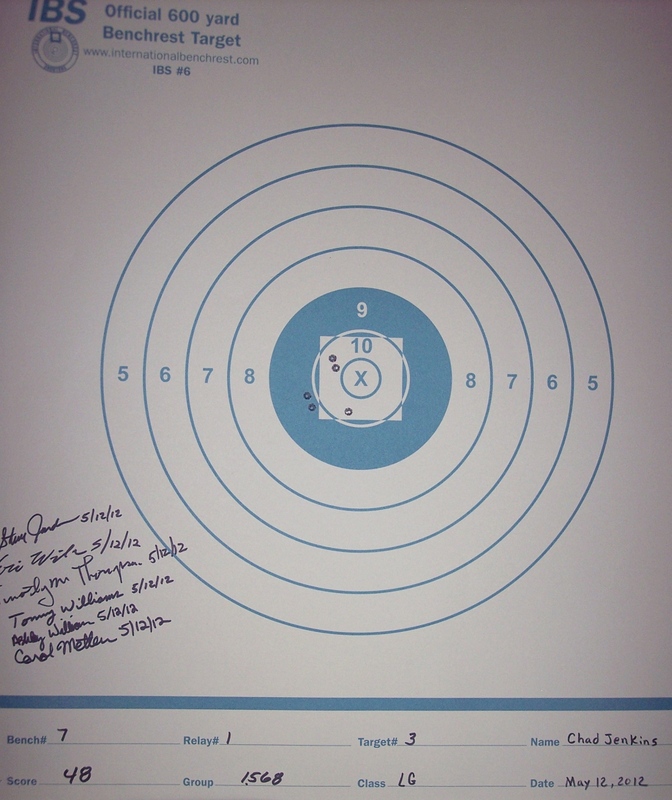 The current NBRSA record small group (Unlimited) is a 0.049 shot by Hall-of-Famer Gary Ocock in 2009. This is a file photo with a different railgun. This wasn’t the only tiny group shot by Lou over the weekend. Murdica shot a sizzling 0.1262 five-target 100-yard Unlimited Aggregate. That 0.1262 Agg will also be submitted for consideration as a possible record. Here are the individual group sizes: 0.104, 0.183, 0.201, 0.104, 0.039. At this match Lou won both the Unlimited and Sporter class. “It was a great weekend” Lou reported. What kind of rifle can put five shots in one hole? Lou was shooting an Unlimited-class railgun. This return-to-battery rig (a Kensler railgun) allows the shooter to focus on firing at the perfect time for the conditions. Lou’s Kensler railgun (see below) features a Kelbly top-loader Grizzly action, Shilen 6-groove barrel, and March 10-60X scope. The Shilen is chambered for the 6 PPC cartridge. But there’s something special about this particular 6 PPC — read on…. Lou used a new chamber reamer from Pacific Tool & Gauge (PT&G) with special geometry in the leade/throat section. Called a “Bore Rider” (or sometimes “bore-runner”), this new reamer design cuts a staged, variable taper in the leade/throat area that is quite different than the taper in a typical throat. It’s a little hard to explain, so we’ve included the 6 PPC Bore Rider reamer print below. (Download the PDF file for a better view.) Experts should look at the leade angle(s), freebore, and throat dimensions. You may be surprised. Dave Kiff of PT&G says this Bore Rider design has worked successfully for other cartridge types/calibers as well. Apparently this design helps the bullet center up smoothly in the bore before the bullet engages “hard” in the rifling — or so we’ve been told. CLICK HERE to DOWNLOAD Reamer Print as PDF File. Share the post "Murdica’s Masterpiece — Just About as Good as It Gets"
Last month, shooting at the Piedmont Gun Club, Chad Jenkins put together a stunning 1.495″ Aggregate at 600 yards. Once certified, that will be a new IBS 4-target Light Gun record. Chad’s smallest group was a 1.033″. Chad’s 1.495″ Agg breaks the existing 1.6068″ record set by Sam Hall in 2011. Chad was shooting a no-turn-neck 6mmBR featuring a BAT action, Krieger barrel, and Shehane ST-1000 fiberglass stock. We had the chance to talk with Chad and learn more about his record-setting rifle, and the methods he uses to achieve superior accuracy. Chad was kind enough to tell us about his equipment and what he does to build very, very accurate ammo. For starters, Chad wanted to “say thanks to Lewis Winkler, James Coffey, Mike Davis, and Larry Isenhour” all of whom provided invaluable help and support over the years. Reloading — I don’t claim to be an expert. But I will say that consistency is all-important. I learned this first from my friend Lewis Winkler (who passed away), and then James Coffey. Lewis always told me that the main thing is that you must be consistent in everything — when you’re sizing, when you’re weighing, when you’re seating bullets. You can’t be deviating and expect your loads to shoot. Mental Game — I don’t go to a match to beat anybody, or to compete against anyone in particular. I shoot the best I can shoot and let the chips fall where they may. Even in practice, I basically compete against myself and I try to do the same thing in a match. Focus (when to have it and when to relax) — I do try to stay focused when I’m shooting. But I also try to get away from the pressure between relays. A lot of the guys spend 15-20 minutes looking at everybody’s targets. I just look at my own targets and go back and sit down and relax. I don’t try to overthink things. When I was a teenager I was a successful competitive golfer. And in those days, I didn’t think about it … I just stepped up to the ball and hit it. I think, with some competitive activities, “thinking too much” can probably mess you up more than it helps. 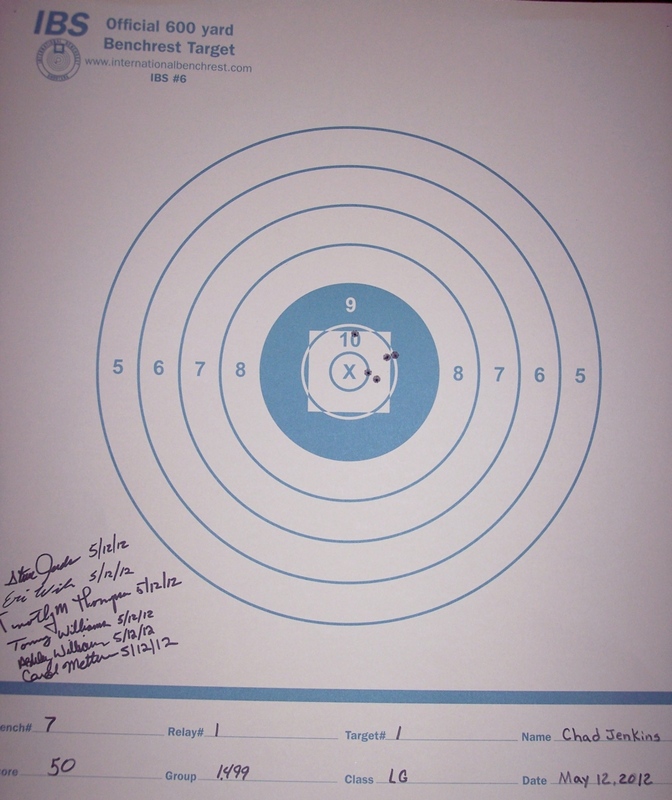 Share the post "Profiles in Accuracy: Jenkins Sets 600-Yard Agg Record with 6BR"
The regular, monthly 600-yard benchrest match at the Piedmont Gun Club in Rutherfordton, NC rivals a National event in terms of the quality of the shooters and the rifles. And just yesterday, a pending new IBS 600-yard, four-target Light Gun Group Aggregate Record was shot. Chad Jenkins put together a stunning 1.495″ Aggregate shooting a Light Gun with Shehane Tracker stock and Krieger barrel. Chad’s smallest group was a 1.033″. The caliber was a ‘Plain Jane’ 6mmBR. Chad’s 1.495″ Agg breaks the existing 1.6068″ record set by Sam Hall in 2011. Share the post "Chad Jenkins Sets IBS 600-Yard LG Record with 1.495″ Aggregate"
Tom Mousel of Kalispell, Montana, has set two new multi-match Aggregate 1000-yard World Records. Shooting at the Deep Creek Range in Missoula, Montana, Mousel set a new 10-Match Light Gun World Record with a 5.8954″ Aggregate. That’s an average group under 6 inches for 10 matches! Mousel also set a new Light Gun 6-Match World Record with a 4.8813″ Aggregate. That 4.8813″ Agg bettered the existing 5.251″ Light Gun 6-Match Record Agg set by Mousel himself last season (2009). Congratulations to Tom for a lot of hard work and some real fine shooting! Tom set these Aggregate records over the course of the 2010 season of the Montana NW 1000-yard Benchrest Club, which is affiliated with the Original Pennsylvania 1000 Yard Benchrest Club (Williamsport). If you want to compete with Tom Mousel and the whole Deep Creek gang, head up to Missoula in August. The Montana NW 1000-yard Benchrest Club will host its 1000-yard Championship Shoot on August 13, 14 and 15. The Montana Club’s current rules allow IBS and NBRSA guns in the 17-lb and Heavy Gun Classes. In addition there is an 11-lb Sporter class. All guns shoot 10-shot groups at 1000 yards. Entry fees are $30 per gun, per day. Camping is available at the Deep Creek range, and there will be a Catfish Fry on Friday and a Steak Dinner on Sunday after the last match. Tom says: “Come to Montana and shoot with us. We have over $16,000 worth of prizes this year.” For more info, or to request entry forms, contact Tom Mousel at 406-450-0917, or Pat Capehart at 406-821-3737. Share the post "Mousel Breaks 1K Multi-Match Records At Missoula, Montana"
Texan Jackie Schmidt, using a 13.5-lb 30BR Heavy Varmint rifle, has shot a pending NBRSA world record 5-target, 5-shot-per-target Aggregate at 100 yards. Jackie’s 5x5x100 Agg measured 0.1118! How small is that? To help our readers visualize this, the illustration at right shows what a SINGLE 0.111″ 5-shot group (with .30-cal holes) would look like. 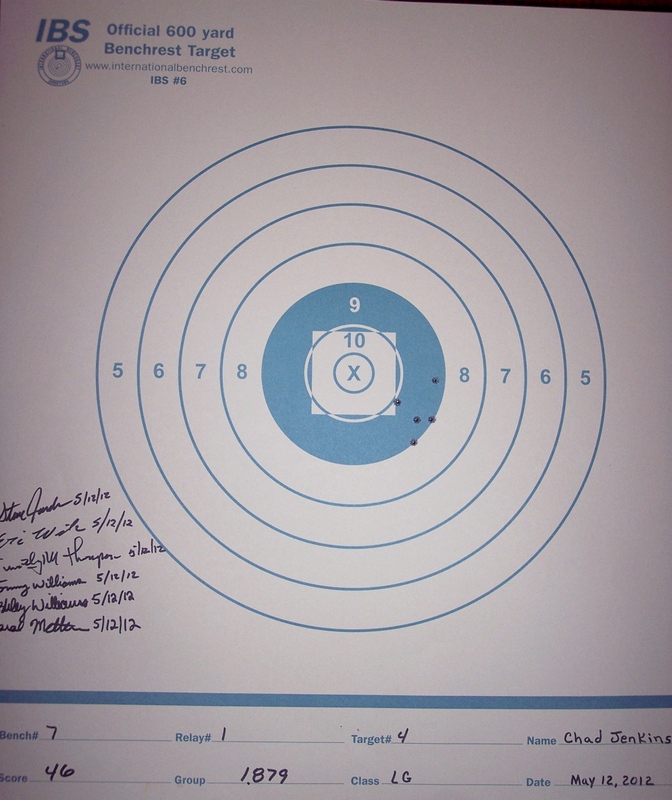 Jackie’s actual measured group sizes for his five-target Aggregate were: .153, .093, .120, .100, and .093. If this record is certified, it will be the best 5×5 100-yard Agg ever shot in history by a bag gun in competition. Jackie’s Agg may also beat the “Unlimited” (Rail Gun) 5x5x100 records, but we’re still researching that. Remarkably, Jackie shot his 0.1118″ Agg with a stout-recoiling 30 BR (not a PPC), he did it in howling winds, and he did it with brass that had been fired 30 times! He also shot the entire Agg without cleaning his barrel. Gun Specs: Jackie was shooting a 13.5-lb 30 BR that he chambered and assembled himself. The barrel is a 4-groove, 1:18″ twist, HV-taper Krieger, fitted with a 5.5-oz. “snubber” barrel tuner made by Jackie. The action is a cast Farley, “glued and screwed” into the stock and fitted with a Jewell trigger. The stock is a Robertson Composites BRX, built with extra weight to make the gun a dedicated 13.5-pounder. The scope is a 50-power March. Record Load: Jackie was running a stout load of Hodgdon H4198 powder, Federal 205M primers, and BIB (Robinette) 112gr flat-base bullets seated about .003″ into the lands. Load is “tuned for 3020 fps”. Cases are formed from Lapua 6mmBR brass using a dedicated forming barrel that blows the necks out to 0.330″ in one step. Trim length is 1.540″, longer than most 30 BRs. Jackie turns the necks for a total of .002″ clearance. 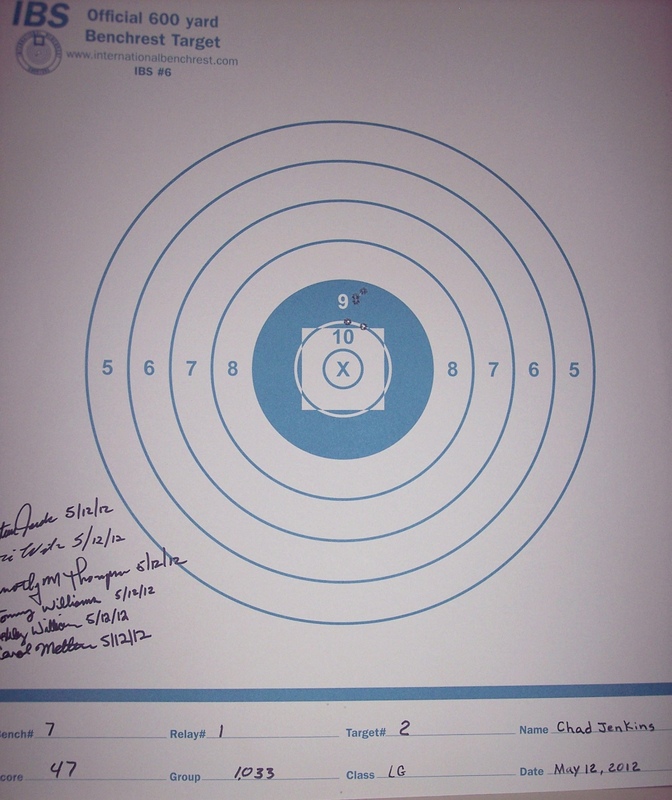 Share the post "Triumph in Texas: Jackie Schmidt Shoots 0.1118 5-Target Agg at 100 yards with 30 BR — Best in History"